Again fate helps me to remember the truly pleasurable friendship I shared with the talented, funny, on-the-edge but charming with it … Paul Williams. From the moment we met in ’63 when we both played in the Wes Minster Five right up until only two weeks before his ‘leaving’ I never stopped laughing in his presence. My kindest thoughts go to Diane, Sam and Ashton of course. Wonderful voice, good bass player, excellent fake piano-player with a remarkable ear for harmony and absurd humour. An enormous loss to music and friends. Rest in peace Squiblett … your memory will stay with me forever. Posted in music friends, personal, Uncategorised. 3Bs? The Broadstairs Blues Bash of course! Get your tickets now as they are selling fast now Zoot is on the cover of W3Gigs. Click for more. W3 on 3Bs – roll up! In other news – Happy New Year Rollers! Let the Big Times just keep on rolling. Here’s what we know so far – with just three days to go, confirmed performers for Monday’s benefit gig featuring Zoot and the Big Roll Band – Al Kirtley, Papa George, Paul Cox and Bob Simmons – will now be joined by Alan Price, who will perform a very special solo set from the piano. Below is the press release that’s already been sent out by organisers. Organisers of the benefit concert for musician and loudspeaker manufacturer Paul McCallum have announced that any unsold tickets will be available on the night. 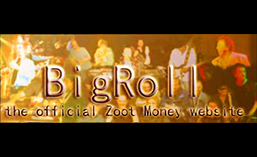 The event, which features Zoot Money’s Big Roll Band and Guests, takes place at O2 Academy 2, Islington on October 29th. Interest has been steadily building, both among PLASA members and other friends in the sound reinforcement industry, since it was announced. Popular bass player (and original member of the Wombles) Paul McCallum was not only the brains behind PLASA member company, Wembley Loudspeaker, but has played with many stars over the years, including Billy Fury and Helen Shapiro. However, he is now suffering from an advanced form of Multiple System Atrophy and is confined to a hospice. The money raised will help meet Paul’s medical bills. Counting down with just ten days to go till the star studded benefit gig at the O2 Academy Islington on October 29th for former Big Roll Band bassist Paul McCallum, who is sadly in hospice care since his medical condition has worsened. The popular bass player, diagnosed with an advanced form of Multiple System Atrophy some years ago, was not only the brains behind PLASA member company, Wembley Loudspeaker, but also bass player with Zoot Money’s Big Roll Band and a host of other major names, including Helen Shapiro and Billy Fury. Paul is affectionately known as ‘The Womble’ from his days as Uncle Bulgaria in Mike Batt’s original Wombles. In addition to playing their own set Zoot and the boys will provide the rhythm section for guest musicians who will appear on the night. All proceeds from the event will go towards funding Paul’s medical expenses. Posted in gigs, music friends.